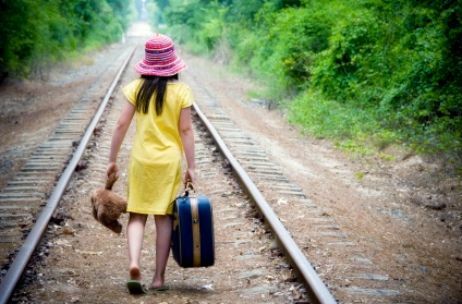 Have you ever thought about running away from home? When I was 15, I gave it serious thought. I wasn’t abused by my parents – I just didn’t get along with my mother. I thought she didn’t know anything! 😦 I wasn’t saved so I had a lot of “junk” stored in that brain of mine. 😕 When my mother saw what I was about to do, she offered to help me pack my suitcase 😥 I didn’t run away but looking back on that situation, I’m glad that my mother chose to respond to me in that way. I’m glad because I could have faced a totally different life had I succeeded in doing so. I may not be saved today. I may have lived a very different life or I may have died. For you, teen girl, there are especially more dangers awaiting in the streets. You will be like a sheep waiting to be caught by wolves. There are so many guys out there that would love nothing more than to give you food and a place to stay but you would have to “pay them back” in some way. Teenagers seem to think they are invincible but that is just not the case. The FBI has countless files of runaways, and many of whom are tracked down and are either dead, drug addicts and/or prostitutes. I know that you are thinking that this would never happen to you but it’s not a matter of “if,” but a matter of “when” it will happen. It’s not a glorious lifestyle at all. If you’re still thinking of running away, then you must think ahead more than just a day or two. How will you earn money to feed and clothe yourself … what about housing? If you are one of those “lucky” girls who finds a job, how will you get to work if you don’t have a car? If you are under age, how will you even find a job? These things just don’t magically appear. Up until now, your parents have given you a roof over your heads, food on your plate, a warm bed to sleep in and they’ve paid for the clothes on your body. But now you will be on your own and will have to provide for these things. It’s important that you think of these things before you make the biggest mistake of your life. ~Luke 15:11-32 And he said, A certain man had two sons: 12 And the younger of them said to [his] father, Father, give me the portion of goods that falleth [to me]. And he divided unto them [his] living. 13 And not many days after the younger son gathered all together, and took his journey into a far country, and there wasted his substance with riotous living. 14 And when he had spent all, there arose a mighty famine in that land; and he began to be in want. 15 And he went and joined himself to a citizen of that country; and he sent him into his fields to feed swine. 16 And he would fain have filled his belly with the husks that the swine did eat: and no man gave unto him. 17 And when he came to himself, he said, How many hired servants of my father’s have bread enough and to spare, and I perish with hunger! 18 I will arise and go to my father, and will say unto him, Father, I have sinned against heaven, and before thee, 19 And am no more worthy to be called thy son: make me as one of thy hired servants. 20 And he arose, and came to his father. But when he was yet a great way off, his father saw him, and had compassion, and ran, and fell on his neck, and kissed him. 21 And the son said unto him, Father, I have sinned against heaven, and in thy sight, and am no more worthy to be called thy son. 22 But the father said to his servants, Bring forth the best robe, and put [it] on him; and put a ring on his hand, and shoes on [his] feet: 23 And bring hither the fatted calf, and kill [it]; and let us eat, and be merry: 24 For this my son was dead, and is alive again; he was lost, and is found. And they began to be merry. 25 Now his elder son was in the field: and as he came and drew nigh to the house, he heard musick and dancing. 26 And he called one of the servants, and asked what these things meant. 27 And he said unto him, Thy brother is come; and thy father hath killed the fatted calf, because he hath received him safe and sound. 28 And he was angry, and would not go in: therefore came his father out, and intreated him. 29 And he answering said to [his] father, Lo, these many years do I serve thee, neither transgressed I at any time thy commandment: and yet thou never gavest me a kid, that I might make merry with my friends: 30 But as soon as this thy son was come, which hath devoured thy living with harlots, thou hast killed for him the fatted calf. 31 And he said unto him, Son, thou art ever with me, and all that I have is thine. 32 It was meet that we should make merry, and be glad: for this thy brother was dead, and is alive again; and was lost, and is found. If you are being physically abused at home, talk to a Pastor of a nearby church. He is trained to help in these types of issues and can guide you as to what to do. If you’re not being abused teen girl, no matter how much your heart is telling you to run away, don’t do it! If you are truly born again and love the Lord, you will think on this, pray about it and talk to your parents about what is going on in your heart. The Lord wants to lead you to do what is right – all you have to do is ask Him! ~Proverbs 3:5-6 Trust in the LORD with all thine heart; and lean not unto thine own understanding. 6 In all thy ways acknowledge him, and he shall direct thy paths.